Here at Ragged Isle, we know that the ever-present dread on the island, not to mention the constant threat of death, can be kind of a bummer, as is the realization that the end is near for our series. Episode 1: Louis helps newcomer Madame Clelia fend off the ghost of a vengeful Centurion. Sebastian takes 45 minutes to decide on a sandwich. Episode 2: Someone is stealing pickles from the Ragged Isle store! Sheriff Dalton reeks of vinegar; denies knowledge. Episode 3: Mac and Dirty Bill find a magical amulet that let's them swap bodies. Trevor mistakenly believes Gertie Kendrick is performing her death monologue. Episode 4: Vance Trundle spends the day asking people if they've heard about "The Internet." Paul replaces Eric's cat for the fourth time. Episode 5: Back on the Mainland, Dr. Brian Hoffman sneezes in the lab, destroys thirty-years of research. Julie tells her troubles to a seal. Episode 6: Paul Soucey asks Harrison Shaw for his lawnmower back. Harrison declares it part of the "Restricted Zone." 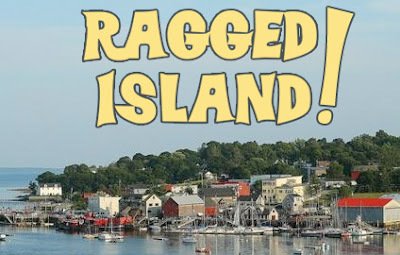 Episode 7: Rachel Moody scares another visitor away with her "first time to Ragged Isle" pep talk. Trevor Stebbins hates doing laundry. Episode 8: Everyone regrets it when Julie Katsarakis is named "Lobster of Ceremonies." An angry islander declares the ferry service "disrespectful" and moves to cancel both. Episode 9: Colleen Drake refuses to let Gertie take "50 Shades of Gray" out of the library. Eric regrets telling Paul about his twin sister. Episode 10: Sheriff Dalton enlists the help of Gordon to kill a rouge shark. Harrison Shaw recounts the sinking of the USS Indianapolis. Episode 11: Gus Hendershot spends all day trying to win KISS tickets. Julie learns a lesson in responsibility when Rose Fuller lets her keep an orphaned dolphin in the tub. Episode 12: Disaster strikes when the Dock Boys are stranded on a nearby island. Everyone cringes when Bill keeps wanting to be called "Piggy." Episode 13: A mysterious ghost ship prevents supplies from getting to the island. Gus won't play Marco Polo with Sebastian in the store anymore. Episode 14: Eric Burke asks Julie out on a date same day that Madame Clelia gives him starfish earrings "for protection." Gordon and Dylan Strang hunt the most dangerous game. Episode 16: Things get crazy when vampires attack the Ragged Isle Halloween dance! Sebastian gets trapped inside his Iron Man costume. Episode 17: Julie calls an emergency meeting to tell everyone how great they look today. Mac asks the Dock Boys: "You guys wanna go see a dead body?" Episode 18: Vance catches sight of a white whale and goes mad trying to report on it. Colleen Drake's new protege (special guest LeVar Burton!) teaches a reluctant Paul how to read. Episode 19: A series of practical jokes gets out of hand, leaving Louis and Dirty Bill gravely injured. Sheriff Dalton threatens to bring in a driven, young detective from the mainland. Episode 21: A lobster shortage forces the Paul and Eric to start up a lemonade stand. The creatures of the forest help Julie fold her laundry. Episode 22: Eric Burke contracts a rare singing disease just in time for Rose's annual Ragged Isle musical review! Gordon purposefully sprains his ankle. Episode 23: A midnight boating accident kills two and sends shock waves through the island community. Special musical guest: Coldplay!